We’d love your help. Let us know what’s wrong with this preview of Five Wounds by Katharine Edgar. It is 1536. The north of England has boiled over into rebellion against Henry VIII. Sixteen year old Nan Ellerton must choose - help the rebels, even though it could mean paying the brutal penalty for treason, or betray her beliefs and risk eternal damnation. Five Wounds is a novel for teenagers that tells a story of adventure, passion and courage, set against the backgrou It is 1536. The north of England has boiled over into rebellion against Henry VIII. Sixteen year old Nan Ellerton must choose - help the rebels, even though it could mean paying the brutal penalty for treason, or betray her beliefs and risk eternal damnation. To ask other readers questions about Five Wounds, please sign up. I received this book in exchange for an honest review All About YA. I have a weakness for books that take place in the 1500's. That being said the book was very well written. I have never read a more detailed book about the rebellion against Henry VIII. I know some of the characters were not real but a lot of them were. Which may for a interesting read. I will be looking in more books by this author. Five Wounds is a gripping read that grabs you from the word go. It is set against historical events I know very little about (the Pilgrimage of Grace) and in a part of England I’m unfamiliar with (Yorkshire) but I was completely swept away into this world as it was so brilliantly, convincingly realised. The story begins with 15 year old Nan, not long home from the convent, being unwillingly betrothed to the much older and much married Lord Middleham. Having known relative freedom in the convent Five Wounds is a gripping read that grabs you from the word go. It is set against historical events I know very little about (the Pilgrimage of Grace) and in a part of England I’m unfamiliar with (Yorkshire) but I was completely swept away into this world as it was so brilliantly, convincingly realised. The story begins with 15 year old Nan, not long home from the convent, being unwillingly betrothed to the much older and much married Lord Middleham. Having known relative freedom in the convent (which has closed as part of Henry VIII’s dissolution of the monasteries) she is unhappy to be married off to a man with children older than her, especially when she meets Francis, Middleham’s son and heir, a far more attractive prospect. However she acquiesces to the betrothal to save her sister from having to marry in her stead, and to restore her position in the family honour – there is are hints about the terrible thing Nan has done in the past that led to her being sent away to the convent, but we do not find out why until part way through the book. Lord Middleham is on the verge of supporting the uprising and joining the rebel cause under the banner of the Five Wounds of Christ - we are introduced to the intrigues behind the ill-fated revolt against the break with the Catholic church, the rebellion itself and the terrible penalties exacted for its failure. I knew little or nothing about these events, as most popular historical novels of the period tend to concentrate on Henry and his wives, but this well-researched book made them real and compelling. Cleverly, Ms. Edgar does not side entirely with the rebels – although we see this world through Nan’s eyes, through the depiction of such characters as the weak local priest (and his common law wife and children) and the venal and cowardly Abbot, she subtly draws a picture of the then-corruption of the Catholic church and leaves the reader to judge. Nan becomes involved in the revolt while preparing for a marriage she does not want, and the character of Will Shepherdson, blacksmith, is introduced. When the plan to aid the rebels goes wrong and they are forced to flee into the woods, there is a sense of real danger. The story hurtles on apace and I could not put it down – but at the same time I didn’t want it to end. It is exciting, gripping and moving by turn - without giving anything away, there is a parting of the ways that is utterly heart breaking and brought me to tears. To modern eyes, the power of religion, with Nan and her contemporaries’ absolute belief in Hell as a real place and God as an actual force can seem almost ridiculous, which together with the rigid sense of hierarchy in society can make characters behave in ways that seem irrational and self-destructive, but it is a tribute to Ms Edgar’s writing skill that it is utterly believable and you find yourself shouting at your kindle for the character not to make those decisions! All the characters, even the bad guys (in particular a world-weary Duke of Norfolk) are fully fleshed out. Nan is a sympathetic and compelling heroine – intelligent, loving, unafraid to do what she sees as the right thing, yet all too human and led by her emotions as well as her head. No mere damsel in distress, she wields a mean bow and during the course of the novel learns to use a rapier too. I hope that we see more of Nan in many future works by Ms. Edgar. I received a free e-copy of this book in return for an honest review. This is not your average Tudor historical novel; along with Katharine Edgar's characters, we hear about events at court and in the south only through letters and whispered rumours. This is another world, one that most of us didn't cover when "doing the Tudors" at school -- the world of the religiously conservative North of England, with minor nobility and common people caught up in massive political and religious upheaval. There is a lot of well-researched historical detail that we need to take on board as we follow Nan's story -- not just the events surrounding the Pilgrimage of Grace but also minutiae of everyday life and contemporary Tudor attitudes to class, honour, gender and religion. It's a tribute to Ms Edgar's skillful writing that for the most part this is done very naturally without the reader feeling that he or she is stuck in a history lesson. It's easy for historical fiction featuring strong YA female characters to ring a little false; how likely is it that well-born young women would cast off the restrictions of their class and gender? In Five Wounds, though, the string of events that leads Nan into taking an active part in rebellion and adventure is cleverly thought-out so that each step down the path seems perfectly natural. We feel that Nan has no realistic alternative to being drawn deeper into conspiracy and into danger. It's well-done too that, reluctant though Nan originally is to enter into the marriage, her older bridegroom-to-be is no grizzled tyrant but a sympathetic if slightly grave man in early middle age. In fact most of the characters we meet are well-rounded and, in general, the antagonists are very believable as weak or flawed human beings rather than out-and-out villains. I was particularly impressed at how, writing for a largely secular twenty-first century audience, the genuine religious convictions of the sixteenth century are so effectively portrayed. For Nan's actions to make any sense we need to understand her deep religious faith and how important it is to her, and this aspect of her character is very well developed. I found the first two-thirds of the book uniformly excellent; a compelling read that left me unable to put it down, without a single false note. In the last third I felt that one antagonist descended too far into melodramatic villainy (although (and it's very difficult to phrase this comment without spoilers) I did appreciate the fact that this character moved to take on an antagonistic role) and I felt that Nan's actions became more out-of-character). The ending was also a little unsatisfying, unless it betokens a forthcoming sequel (in which case, hurrah!). I would definitely recommend this book to anyone who enjoys historical novels and doesn't object to a young adult protagonist, and I very much look forward to reading Katharine Edgar's future books. I would like to thank the group Insatiable Bookworms, and the author, Katharine Edgar, for giving me the opportunity to read Five Wounds in exchange for an honest review. Katharine Edgar does an excellent job at portraying life in Tudor times by providing plenty of historic detail, effectively creating a great backdrop to the story. I also enjoyed the wealth of religious practice depicted throughout since it played such an important role. 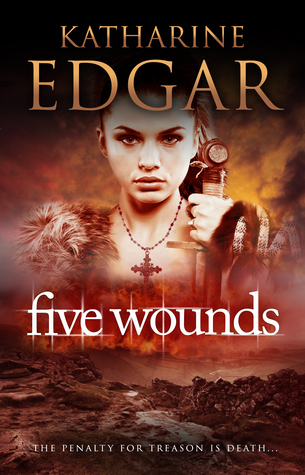 The author painted many beautiful scenes and the writing f I would like to thank the group Insatiable Bookworms, and the author, Katharine Edgar, for giving me the opportunity to read Five Wounds in exchange for an honest review. Katharine Edgar does an excellent job at portraying life in Tudor times by providing plenty of historic detail, effectively creating a great backdrop to the story. I also enjoyed the wealth of religious practice depicted throughout since it played such an important role. The author painted many beautiful scenes and the writing flowed very well for the most part. There were though a few too many scene jumps for me where, for instance, a dispute took place and in the next paragraph it seemed resolved or forgotten about. You can imagine how they might resolve their differences, but I would rather read a convincing paragraph on how that was achieved. The method used did well to keep the pace up; however, I felt that some scenes needed more work to string them together. This has been a difficult book for me to rate because I went into it expecting something rather different to what I got. I was certainly interested in the premise, but the story didn’t really work for me. Although there were aspects I enjoyed, I felt the characterisation was lacking somewhat and this pressed negatively on some of the dialogue and interaction. Some lead characters felt a little undeveloped and one in particular who became something else towards the end of the story boggled my mind quite a lot; I’m still unsure what happened. As for Nan, I liked her at the start very much because she came across as a strong heroine to admire; her sound devotion to her family, faith, and bird, drew me in. But slowly little things started cropping up, mainly in her internal monologue, that I didn’t like in her character, and often these things made her such a hypocrite that I found it difficult to relate to her. I should point out that I’m not the targeted audience being that this book is aimed at teenagers and I’m in my thirties. While reading this book, you cannot be in any doubt that a lot of hard work went into its creation. It just didn’t do it for me because of the above. FIVE WOUNDS is a historical YA set in Tudor England, with 15-year-old Nan as the protagonist. The story lured me in from the very first pages, when Nan is gifted a hawk that she trains. The descriptions are vivid and paint an idyllic image of a reality that very soon turns threatening when Nan is promised in marriage to a much older man, a Lord eager to expand his lands. A rebellion is underway in the northern parts of England where Nan lives, and against her will she becomes involved in most vi FIVE WOUNDS is a historical YA set in Tudor England, with 15-year-old Nan as the protagonist. The story lured me in from the very first pages, when Nan is gifted a hawk that she trains. The descriptions are vivid and paint an idyllic image of a reality that very soon turns threatening when Nan is promised in marriage to a much older man, a Lord eager to expand his lands. A rebellion is underway in the northern parts of England where Nan lives, and against her will she becomes involved in most violent politics, where men rule and their people suffer terribly as a consequence. The way she navigates the often horrific troubles she is forced to tackle was refreshing, real and believable. I was utterly impressed with the historical details of this book – no doubt countless hours have been spent on making minute details on topics ranging from practicalities of women’s clothes to buildings, horses, weaponry and penalties, exact. The author also has a style of writing that visualizes these details to the reader with clarity and ease, and I can easily picture the story as a very gripping TV series with a memorable range of characters. Notably, Nan herself stands out as a person one can identify or empathize with, as she is a complex character who has to juggle her fair share of difficulties. Her sometimes flawed decisions, and her cleverness and youthful optimism mixed with fear of God’s wrath and what other people with power can do to her, make hers an authentic voice. Many of the other characters are also convincingly drawn - Lord Middleham is one such character (to my surprise, given who he is), as is Will the smith. I would have liked a couple of the characters to have had a few more dimensions to them, and one character who transformed quite a bit was perhaps too one-dimensional in the end, but on the whole the characterization was varied and plausible. There is action aplenty in this book, but also introspection, and the story should appeal to youths (and adults!) who enjoy strong and human heroines at the center of novels. The historical facts are also a great plus. I love reading novels that expand your understanding of an era, and this certainly does that- it's exciting and plot-driven, and should appeal to younger history buffs who like a tale of adventure and hard moral choices. The characters are vividly-drawn (sometimes too much so- Nan got on my nerves at times!) and the sense of peril is constantly close at hand. Review is also posted on Let’s Say It’s A Blog. Historical fiction is a genre that takes a special place in my heart. Reading a historical fiction for me is like ‘traveling’ with a time warp all the way to a whole different dimension in the past. Getting to know the life of people in places that used to exist somewhere around us ―or might be just right where we are right now― centuries ago through a story, gives me wonderful experiences that I could never get from another genre. I always loved history when I was still attending school. While reading historical literature is focusing on certain important events, historical fiction book gives more casual description about people living at the time, how they talked, how they interacted and behave among a strict conventional society. It’s like studying in a fun way, as long as we understand the line between real events and the fictional ones. Five Wounds took place during Tudor era and was told with Pilgrimage of Grace as the background event. I know almost nothing about both things. That made me more excited to read the book because I’d get to add something more to my knowledge about England history after I finished it. And I did! Nan Ellerton was the daughter of Sir Thomas. Unlike her sister, May, who seemed to always please their father just by being born pretty, Nan was always the black sheep in her family. She wasn’t as pretty as her sister but at least she was the brighter one. But that too, no longer mattered since the accident 10 years ago that brought shame to her family and made her forever remembered as a disgrace in their family history. She was sent to the convent ever since until she was not able to see her mother’s face for the last time. Once she’s back home, Nan lived under worse treatment from her father. Good thing she still had her sister and her grandmother who could make her life more bearable. If that hadn’t enough as a life test for Nan, now she was faced with the worst one. One fine afternoon turned into a nightmare when her father said she was to betroth to a baron from the next dale named Lord Middleham. An older ―way much older than her 15 years old age― and had-married-three-times Lord Middleham. She had no other choice but to obey the arranged-marriage because of two things. First, if she didn’t make it, it’d be May who’d take her place at betrothal. May herself had betrothed to her sweetheart so there was no way Nan would have a heart to do that to her. Second, it would do good to erase her dark history as a disgrace if she married to a baron. Nan dreaded her future where she kept imagining would be more awful than her life now. She would live in a strange castle, married to an older man with unknown personality, and there would be no May or her grandma to make everything bearable. What she didn’t expect was for her life line to changed 180 degrees as the rising made a move against King Henry VIII’s break with Catholic church in 1534. Not only she was tangled in sinful feeling with Middleham’s son, Francis, but she also had to dodge around from the anti-rebellion as the result of her fearless support to the rebels. She met a lot of people during the process including a blacksmith with interesting personality. In a flash, Nan found her life turned upside-down as her own belief wavered by the heart-wrenching violence happened around her. Ms. Edgard as the author did a great job with the vivid details and all. Not only she had an excellent understanding about this historical event, she also succeeded in describing people’s daily life during Tudor era aside the rebellion and the situation of the dale very well. As people like me who knew nothing about the historical event, this was really helpful. Not only did she ‘play’ with rich details of the event, she also used lots of foreign terms along with conventional conversations ancient-like and she paired them all out there in a way that was easy to digest without I even needed to find the meaning of each terms. Like I said, this was such a great experience of studying history in a fun way. Ms. Edgard provided historical note in the end stating the clear line between reality and fictional ones from the book so I could easily identify them. All the fictional characters on the book had subtle characteristics each except the main character, Nan, who was described as one realistic girl existed at the time. Unlike her sister, she’d tasted the bitter parts of life ever since she was 5. Nan seemed having a strong character at first. I was mesmerized by her determination in joining the rising. How she always based her demeanor on what she believed was true under her religious view until myriad of awful things taking turns coming to her life making everything she’d been believed faltered away. Sometimes I forgot that she’s only 15. Lord Middleham and Francis both had difficult characteristics to read. I found myself feeling cautious at each of them back and forth. And close to the end, things unraveled in a surprising way. And there was also another character that started to get involved actively halfway through the book but apparently held on an important role for the ending. Ms. Edgard didn’t provide enough description to each character’s personality, instead we were led to judge them on our own based on the way they interacted with each other and how they talked to Nan as the narrator of the story. I was totally immersed into the story. The vivid description of the situation at the time was enough to convince me that I was indeed ‘travelling’ with time warp all the way into Tudor England. Despite how wrong Nan had strayed from her original belief, I ached for her. She was faced with lots of misery ever since she was still an innocent kid. Sent away from home caused her to lack of motherly love. Then her father forced her to marry someone she didn’t love. And in the end the rising happened, followed by merciless punishment after the failure act of rebellion. I personally thought it was about time Nan snapped off. After all she was only 15 turning 16. I found the story interesting and a bit fascinating. It flowed very well, and stayed on point, but I'm not raving over it. Nan, annoyed the hell out of me. For a girl that was raised in a nunnery, she's basically a harlot. Not so much as she slept around, but every damn second, that she came out of that nunnery, she was having crushes left right and center. I don't even know what to call it. For all her beliefs, that was nailed into her head since she was five and how she wanted to be a nun, I can't seem wrap my head around why, she was so quick to dishonoured it. She swore her loyalty to the cause, but couldn't keep her hands to herself? She fell too hard, too fast. I guess being in that nunnery made her lose common sense. Enough on that, I'll be here all day raving about it. I did like some things about Nan. When she was captured she didn't break, lost hope and didn't give up. Though not loyal to herself, was loyal to the cause and her friends. There aren't many people in the world that could have gone through what she did and not break or thrown down in defeat. I just can't get over some of the stupid decisions she made. I found that the synopsis and the book cover were misleading. I was expecting something totally different, more along the line of a Joan of Arc type of deal. But the story, as I said, though interesting, didn't have any impact and it fell short. Not only did it start slow, it felt at times, forced. Like the love quadrilateral, there was no substance, or for lack of a better word, emotion. Love was thrown around willy nilly, and I felt nothing for it. Nor did I feel anything for the characters. At one point I was sure Nan was going to die at the end, and I didn't care. The only real thing that kept my interest and the reason this novel managed to scrape into the three star spot, is because of the historical references. A lot of research went into this book and you can tell just by reading the first few lines. I've always been fascinated by the past, and how far we've come. I also start to think "If I got transported back to that time, I'd be called a witch and probably get burned at the stake"
In all, this read wasn't terrible. In fact, it was very well written, and it had a slow but smooth rhythm. Though I didn't quite like it, and there's still something that's irking me about it, I do recommend it. It wasn't for me, but I'm sure it will make someone else's cup of tea. Five Wounds is a historical fiction novel set during the 1536 “Pilgrimage of Grace”, a mass uprising in northern England (focussed on Yorkshire) against Henry VIII’s policies of breaking with the Roman Catholic Church and dissolving its monasteries. This book covers the complex events through the eyes of a young girl with a refreshingly different point of view. Nan Ellerton is a young girl about to be unwillingly married when the Pilgrimage strikes and the tale of her modestly noble Tudor life is convincingly rendered. She has spent time in a nunnery and thoroughly believes in relics, monks, nuns, and all the things the policy of the day is against. She is indistinguishably blended into the thick of the pilgrimage and its aftermath. The character I like best is Henry Hutton, the only character, at least initially, who manages to be both a good, honest, loving man and a successful one. He tries to be kind to everyone throughout, not that it does him much good. My favourite part of the tale is when Nan is on the run from the Duke of Norfolk’s man with the poor blacksmith pilgrim Will Shepherdson. His point of view is fascinating and their traditional adventure is wonderfully simple against the main story line’s complicatedness. I found that some minor characters were slightly alike and as there were a lot of them I sometimes found this a little confusing. However, this is a small issue. For young adult fiction, it did have a very adult feel, but I for one actually liked this. Also, on some occasions I thought that the first person focus was slightly limiting, as events in others of the many diverse but connected settings than the one which Nan is in are glossed over. Although I occasionally found this slightly annoying, it is not a problem as in other ways I loved the realistic first person outlook. A gripping tale, that kept me awake into the wee hours, as I couldn't put it down until I'd finished it. This is a fast-paced story, with plenty of drama and intrigue, that still manages to convey a huge amount of historical detail. I loved that this detail was woven skilfully throughout the story, without jarring one out of the narrative. The descriptions of the everyday tasks and duties, combined with historically significant events, give young readers a more rounded view of life in this perio A gripping tale, that kept me awake into the wee hours, as I couldn't put it down until I'd finished it. This is a fast-paced story, with plenty of drama and intrigue, that still manages to convey a huge amount of historical detail. I loved that this detail was woven skilfully throughout the story, without jarring one out of the narrative. The descriptions of the everyday tasks and duties, combined with historically significant events, give young readers a more rounded view of life in this period. The writing is descriptive and tight, easy to read for both adults and teens. My 12 year old daughter is reading Five Wounds now, and is enjoying it immensely. We both found that our lack of knowledge of the specific historical period, and the Pilgrimage of Grace was a slight issue. As we read on, many of our questions were answered, but I did have a quick read of some background information to fill in some gaps. Nan is a believable (if at times slightly irritating!) character. Her religious beliefs, and the way in which they shaped her life, explain very well her motivations. Young readers may not necessarily identify with her religious beliefs, but they can empathise with her, particularly when she makes hasty or unwise decisions. There were a few loose ends, and some fascinating characters who weren't fully explored, so I am hopeful that there will be a continuation of their stories in a later book. This is a wonderful book. It takes the reader effortlessly into the world of Tudor England, providing a wealth of historical details that really bring the period to life. It deals skilfully with the attitudes of the day, tackling sensitive themes of human relationships and nature. This is including abusive behaviour, which it approaches head on, accepting it as part of life and sweeping nothing under the carpet. Yet there is nothing gratuitous about it: it is merely an accurate portrayal of a hi This is a wonderful book. It takes the reader effortlessly into the world of Tudor England, providing a wealth of historical details that really bring the period to life. It deals skilfully with the attitudes of the day, tackling sensitive themes of human relationships and nature. This is including abusive behaviour, which it approaches head on, accepting it as part of life and sweeping nothing under the carpet. Yet there is nothing gratuitous about it: it is merely an accurate portrayal of a historical reality, nothing less. I found it to be a very engaging read, with a rich and varied vocabulary, and realistic characters, as well as interesting dialogue. It is easy to identify with the character of Nan, share her fear of her fate at the hands of the men in her life: her father, Lord Middleham and especially Francis. She is no whitewashed heroine, but a real human being, with faults, rash decisions and emotions. I shall look forward to further works by Katharine Edgar - she is certainbly an author to keep an eye on. A gripping read, and a new novelist to watch for. What are we to make of 15 year old Nan Ellerton, the gutsy heroine of Katharine Edgar's first novel, Five Wounds? In many ways, she is Everygirl -- craving her father's approval, yet chaffing against his authority, bristling with jealousy at the ease with which her perfect older sister fits in, alternately seizing and balking at the temptation of a new romance. But in so many other ways, she is utterly a creature of her times. And what times they A gripping read, and a new novelist to watch for. And what times they are. The year is 1536. Henry VIII has just broken faith with Rome. As part of the crackdown, his officers have shut the nunnery where Nan had spent her bucolic girlhood mastering blackwork embroidery and dreaming of becoming an abbess. When The men of Yorkshire take arms to defend the old religion, Nan yearns to join their cause -- and rises to the challenge when asked to risk her life to transport weapons for the rebels. Along the way, there are chases through secret woodland passages, a terrifying interrogation at the hands of the Duke of Norfolk and a climactic battle on the melting roof of a burning chapel. To survive, Nan must wield a sword, shoulder a bow, and master the art of deception. But most of all, she must figure out whom to trust, as she links her fortunes with a pleasure-loving priest, a hot-headed rebel, and -- ladies, please form an orderly queue -- the hottest blacksmith in Yorkshire. This rigorously researched novel is rich in historical detail about the fraught period of the Pilgrimage of Grace. Yet it never feels didactic, because fundamentally, it is a coming of age tale. Sheltered Nan is learning about her world right along with the reader--not instructing or explaining, but rather, exploring and learning to interpret the complex maze of clues and signs. What she ultimately discovers will enable her to achieve a measure of grace that is uniquely her own. As a first novel, Five Wounds is itself is a journey of exploration for the author into the possibilities and demands of a new craft. Inevitably, the product belies some of the challenges of the process. There are occasional inconsistencies. Furthermore, the opening metaphor of falcon --a powerful bird of prey duped by its tamer into believing itself helpless--remains tantalisingly under-developed (perhaps to be revisited in a future work). But at the many stretches where the narrative hits its stride, the reader experiences the dual thrill of seeing a talented author and fierce heroine gain in strength, confidence, and audacity. This isn't the kind of book I would pick up to read, I'm more for fantasy than historical fiction (weird i know since I've got a degree in history) but I was offered a free e-copy of Five Wounds in exchange for an honest review - and I'm definitely not one to pass up a free book. The story revolves around Nan, a young girl who grew up in a convent and is now betrothed to Lord Middleham, a marriage that would improve the status of her family. However, Nan falls for Lord Middleham’s son but know he This isn't the kind of book I would pick up to read, I'm more for fantasy than historical fiction (weird i know since I've got a degree in history) but I was offered a free e-copy of Five Wounds in exchange for an honest review - and I'm definitely not one to pass up a free book. The story revolves around Nan, a young girl who grew up in a convent and is now betrothed to Lord Middleham, a marriage that would improve the status of her family. However, Nan falls for Lord Middleham’s son but know her duty is to her family. This is happening around the time of Henry VII’s split from the Catholic Church and a huge part of the story revolves around the Pilgrimage of Grace, an uprising that Lord Middleham and his son are part of, and that Nan whole-heartedly supports. First of all the writing is excellent, I could really see Nan’s world and that’s really important to me when I’m reading a book, I could get really immersed in it regardless of where I was. The characters were pretty consistent and well developed, making the story believable and easy to read. It was particularly gripping and I constantly felt like something was just about to happen – although I wasn’t prepared for how sad it would be! Katharine Edgar also does a really good job of educating us about the Pilgrimage of Grace. As I said earlier I studied History but I can’t say I knew much about the uprising despite studying the Tudors for two years! The story is told in a way though that doesn’t feel like a history lesson, it is interesting and informative and not confusing at all, which is particularly important. I did love Nan. While she could be slightly annoying at times she was a real character who showed strength and weakness and never gave up her beliefs, even though she was young she was very strong willed. I think it’s great to see such a female character especially in a book targeted towards young adults because she is so definite and just human. I did feel the love between Nan and Francis came about very quickly and out of nowhere, but it was also quite a short book that took place over about a year or just longer so there was more of an important story to tell of which the feelings Nan has for Francis are key. Recommends it for: All who love an adventure novel! Wow, what an adventure! This book is set in the turbulent times of Henry VIII's England, when his destruction of the old religious ways was still being challenged by the population, most notably in the north of the country. The author brings us straight into the heart of the conflict between King Henry and his dissenters with the story of a teenage girl betrothed against her will to a local Yorkshire lord of the dale, and how she gets caught up in the political intrigues during an uprising again Wow, what an adventure! This book is set in the turbulent times of Henry VIII's England, when his destruction of the old religious ways was still being challenged by the population, most notably in the north of the country. The author brings us straight into the heart of the conflict between King Henry and his dissenters with the story of a teenage girl betrothed against her will to a local Yorkshire lord of the dale, and how she gets caught up in the political intrigues during an uprising against the king. From the very first chapter, I was drawn into the Tudor life of the heroine of the story, Nan. Her feelings at being constricted by her position in a patriarchal society are beautifully contrasted with the freedom she gives her hunting bird, Alceda, and really made me feel for her as she struggles with her only prospect being marrying into a more noble family. And then the adventure begins! The family and villagers of her betrothed lord are involved in an uprising against the king, and Nan is drawn into the uprising and its aftermath. She has to decide where her loyalties lie - with her betrothed, his son, her religion? Her decisions lead her across the dales, living as an outlaw in the woods and finally to York for a gruesome spectacle. Throughout the story as she is chased by varying factions, she has to use her wits and skills to escape death, and worse, as the wrath of the king and those who she thought loved her wreak havoc on those who survived the original uprising. I really enjoyed reading this book. I wanted to know what was going to happen next, I shouted at her to ignore love's young dream and despaired when there seemed no way out. Although I didn't know much about Tudor England, the vividness of description as the story unfolded provided me with a really strong picture of family life of the minor nobility, and how much the destruction of the monasteries adversely affected local people at the time, without detracting from the main adventure. I loved the strength of character of Nan, and how the strength of her convictions carried her through so much, whilst also leading her to her downfall. I sat down to read "Five Wounds" with a touch of trepidation. I don't normally read young adult books, but received a free copy in return for an honest review, and honestly, I'm so glad I did! The story opens with Nan Ellerton, a young girl from a prosperous family. Her grandmother was self-made and she had passed down that fire to her youngest grandchild. It's easy to see parallels between the older woman and her pet, Nan is full of the righteousness of the young and her abusive father has call I sat down to read "Five Wounds" with a touch of trepidation. I don't normally read young adult books, but received a free copy in return for an honest review, and honestly, I'm so glad I did! The story opens with Nan Ellerton, a young girl from a prosperous family. Her grandmother was self-made and she had passed down that fire to her youngest grandchild. It's easy to see parallels between the older woman and her pet, Nan is full of the righteousness of the young and her abusive father has called her home from the nunnery that educated and raised her, so he can marry her off to an older man for the family's advancement. Anne Boleyn is dead, Jane Seymor has married Henry VIII, and the abbeys are being ransacked by reformers. The story is extremely well-paced and the execution of Nan’s final showdown with the villain, had me gripped. It was also refreshing to read the effect that Henry VIII had on normal people and not just his courtiers and the very high-born. Most authors write about his wives and not about the thousands of innocents who suffered as a result of his whims, and Edgar writes so evocatively that you truly sympathise with his subjects and understand the superstition and fear that The Reformation visited on them. I was gripped from start to finish, and have recently read another book based on The Pilgrimage Of Grace, by a very well-known and established historical fiction writer, and Five Wounds was far more compelling. Edgar is definitely one to watch, and I look forward to seeing more from her. I knew little about the Pilgrimage of Grace - an event one would expect to be a much more sedate and gentle affair from its name - prior to reading this book, so I wasn't sure what to expect. What I got was not just a history lesson (although there is undoubtedly an educational aspect to this novel) but a touching and exciting story about what it meant to be a woman from an ordinary family in the reign of Henry VIII. Although much of the plot is driven by the actions of men, the women are the one I knew little about the Pilgrimage of Grace - an event one would expect to be a much more sedate and gentle affair from its name - prior to reading this book, so I wasn't sure what to expect. What I got was not just a history lesson (although there is undoubtedly an educational aspect to this novel) but a touching and exciting story about what it meant to be a woman from an ordinary family in the reign of Henry VIII. Although much of the plot is driven by the actions of men, the women are the ones who feel the effects of what is happening in distant towns and in the courts of the King. They are left to fend for themselves while the men are fighting, not knowing whether they're about to be left helpless and alone or whether they might be punished for something they have taken no part in. That's not to say that they're passive - Nan is far from that - but that they are often powerless to take a hand in their own lives. Even though this is meant for young adults, it can still be enjoyed by anyone who has an interest in this period of history. Katharine Edgar certainly pulls no punches in describing the brutality of life in the Tudor age, and the ominous sense that anybody's life could be ended at any time on the whim of a king or lord. It also provides a useful antidote to the version of Thomas Cromwell given in Wolf Hall; even though he doesn't appear in Five Wounds in person, his influence is everywhere, and is malign. I wonder if Hilary Mantel will cover the sack of the monasteries and the murder of some of the religious orders in her third volume in as much detail as this book does. Nan's journey from naive girlhood to jaded maturity is wonderfully realised; she hasn't been overly modernised to make her more "relateable", for instance by playing down her faith or her devotion to the holy relics of Catholicism, but she has enough flaws and weaknesses to keep her believable. I am pleased from reading other reviews to learn that a sequel might be in the pipeline. This is a character with whom I would gladly spend more time. Set in the North of England during the reign of Henry VIII and shortly after the death of Anne Boleyn, Five Wound, deals vividly with events during The Pilgrimage of Grace, an uprising of commoners against Henry, through the coming of age of Nan Ellerton a young lady betrothed to the much older Lord Middleham. The historical backdrop in this novel is accurately researched and expertly rendered, such that I was immediately immersed in the story with the pace fast enough to keep me interested whils Set in the North of England during the reign of Henry VIII and shortly after the death of Anne Boleyn, Five Wound, deals vividly with events during The Pilgrimage of Grace, an uprising of commoners against Henry, through the coming of age of Nan Ellerton a young lady betrothed to the much older Lord Middleham. The historical backdrop in this novel is accurately researched and expertly rendered, such that I was immediately immersed in the story with the pace fast enough to keep me interested whilst not skimming over details. Although most would find such conviction alien today the author manages to show clearly how this belief permeates society and inform practices (and prejudices). She manages, in what is a short novel aimed at a young adult audience, to give a glimpse into the political and religious complexities of the time as well as giving some insight into the very deep cultural divide between the North and South of England. I really enjoyed reading this novel and found myself awake much later into the night than is sensible and was only a little disappointed in the end as although it was very satisfying (and possibly the only historically accurate means of stability and happiness) there was a hint of the 'happily ever after' . I look forward to reading more from Katharine and to sharing this adventure of Nan's with my own daughter when she is older. 5 Wounds is the story of 15 year old Nan who is betrothed, rather unwillingly, to the much older and frequently married Lord Middleham. Nan had been living in a convent school following an unfortunate incident as a young child, which afforded her a level of freedom that most young girls would never have experienced. However, this is 1536 and the schism between Rome and Henry VIII has changed everything. Nan's dreams of remaining in the convent and becoming a great Abbess are destroyed after Henry 5 Wounds is the story of 15 year old Nan who is betrothed, rather unwillingly, to the much older and frequently married Lord Middleham. Nan had been living in a convent school following an unfortunate incident as a young child, which afforded her a level of freedom that most young girls would never have experienced. However, this is 1536 and the schism between Rome and Henry VIII has changed everything. Nan's dreams of remaining in the convent and becoming a great Abbess are destroyed after Henry's troops close the convent. Instead, Nan was bartered as a commodity to increase her father's status in the local area to a wealthy man who wanted more land. Nan, independent and headstrong, becomes involved in the Northern rebellion against Henry. This is the story of a young girl's coming-of-age during a time of rebellion and revolution. The true strengths of Edgar's writing are the character of Nan and the accuracy of the historical context of the Pilgrimage of Grace. Nan is alternately naive and brave, and her flawed choices reflect her optimism, faith and failure to understand the full consequences of rebellion. She is equally a child and an adult - limited by the constraints of her gender but freed by her desire to change the world. Edgar's love of history and the breadth of her research only adds to brilliance of the story. 5 Wounds precipitated one of my favourite historical discussion The Great Whether-Or-Not Noble Women Learned to Ride Normally Debate. I voted yes on the theory that noble daughters were valuable commodities and no sensible father would allow an expensive piece of property to remain incapable of escape from the numerous wars/ tantrums and general violence that defines European history. This is an exciting story with lots of action. It's very well written and definitely kept me reading, and the protagonist, Nan, is likeable (although she is definitely a teen, and consequently somewhat prone to sudden perhaps unwise decisions). It's the story of a Tudor era young woman, forced into an unwilling betrothal by a brutal father. But it's also a story about the end of a world. So often novels of the Tudor period focus so closely on King and court that your idea of the impact of the st This is an exciting story with lots of action. It's very well written and definitely kept me reading, and the protagonist, Nan, is likeable (although she is definitely a teen, and consequently somewhat prone to sudden perhaps unwise decisions). So often novels of the Tudor period focus so closely on King and court that your idea of the impact of the statecraft and politics is lessened : by contrast, here we get the Dissolution of the Monasteries through the eyes of someone to whom the King is a distant figure, whereas monasticism is part of everyday life and losing it seems almost like an apocalypse. I did kind of wish that the author had fictionalised the setting less : the exact Yorkshire dale and castle are not real, visitable places but are lightly adapted. Reading about real places and people is something I like in historical fiction, so personally I would have preferred a different approach here. But I certainly can't complain that the setting didn't feel real. Clearly a lot of research has been done here, but on the whole the background folds in smoothly and does't get in the way of the story. That said, this is a first novel, and there are a few places where the tone and characterisation lurches a bit. I think it shows a lot of promise though, and will probably read a sequel if there is one. I was given a free copy of this novel in return for a Goodreads review for it, but I would probably have bought it anyway as the precis I came across appealed to me. Henry VIII's rule over the North of England and the uprising against him is usually seen through the prism of the great warlords. This appealing novel shows us young Nan trying to survive and create a halfway decent existence for herself during the tumult. Nan's a mere woman, a chattel, to be married off to the best bidder. Nan pines for the convent where she's spent some years being educated. Being sent off to wed the middle-aged Lord Middleham, whose won daughters resent Nan's arrival, is not Henry VIII's rule over the North of England and the uprising against him is usually seen through the prism of the great warlords. This appealing novel shows us young Nan trying to survive and create a halfway decent existence for herself during the tumult. Nan's a mere woman, a chattel, to be married off to the best bidder. Nan pines for the convent where she's spent some years being educated. Being sent off to wed the middle-aged Lord Middleham, whose won daughters resent Nan's arrival, is not a prospect she relishes. But Nan's wishes will anyway be swept away by the uprising and the need to take sides and declare loyalties. Winding up on the losing side of the rebellion will mean violent punishment. Nan works well as a lense through which to look at appalling consequences of the Pilgrimage in the North--she is gritty and free-spirited but is still very much of her time, believing passionately in her old religion and its relics and rites. And yet she is still a girl who can fall in love--and dangerously. The treachery she confronts smells as bad as the privy in Lord Middleham's castle. Characters in the novel: Nan's father, her betrothed, Lord Middleham and his son, Francis, among them, surprise us right to the very end--there are twists in character development that make it particularly satisfying. The author doesn't shield us from the horror of Tudor retribution towards those who rebelled--there's no talking down to a YA audience. I received a free copy of this e-book in return for an honest review. I don't normally read novels aimed at the Young Adult market for the simple reason I am no longer one and prefer books with more depth but I am very glad that I read this one. Set during the time of Henry VIII and the Pilgrimage of Grace it tells the story of young Nan Ellerton who becomes betrothed to Lord Middleham. He is rich, has children older than her and is not at all her image of the perfect husband. She much prefers his I received a free copy of this e-book in return for an honest review. Set during the time of Henry VIII and the Pilgrimage of Grace it tells the story of young Nan Ellerton who becomes betrothed to Lord Middleham. He is rich, has children older than her and is not at all her image of the perfect husband. She much prefers his son Francis who is handsome and dashing. When the uprising occurs Nan finds her life thrown into turmoil. Instead of meekly sitting at home and letting the men do the fighting Nan is catapulted into the action as she must choose whether to side with the rebels or stay loyal to the King. This is Katherine Edgar's debut novel although you wouldn't know it from the self-assured tone. The story is well-paced with exactly the right amount of historical detail and believable dialogue.The Yorkshire settings are well described and the writing immediately draws you in and carries you along with the action. You never know what you're going to get when you're asked to review a book by a friend, and I have to admit that I started Five Wounds with a little trepidation that I might not like it. I shouldn't have worried. Five Wounds gripped me from start to finish - I started reading it in bed one morning, was nearly late for work, rushed back home to finish it, and had reached the final page by the end of the day. I have to admit that I was so keen to find out what was going to happen next that I didn't You never know what you're going to get when you're asked to review a book by a friend, and I have to admit that I started Five Wounds with a little trepidation that I might not like it. I have to admit that I was so keen to find out what was going to happen next that I didn't read as carefully as I should have, because the novel is filled with wonderful period detail. Katharine Edgar clearly knows her Tudor history inside out, and the idea of making the real history of the Pilgramage of Grace into such a compelling story was a wonderful one. Her knowledge makes the period detail seem effortless, and the result is a richness to the characters and the world that is rarely seen. Her understanding of the religious upheaval that the characters are living through rang particularly true to me. I don't want to give away too much of the gripping plot, but the dramatic final scenes were a wonderful evocation of a young woman seeing everything she believes in fall away. I heartily recommend Five Wounds for all those who love a good historical novel. I was drawn into the story from the very first page. The characters are alive and multi-dimensional, the plot flows well, there is drama and moments of tension when you just can't put the book down. It's an interesting story well told. But there's more. The book is well researched and really takes you into the Tudor days, the way people thought or acted and why, the ideas of honour and loyalty, which are somewhat different from ours nowadays, are shown in a way we (or at least I) can understand a I was drawn into the story from the very first page. The characters are alive and multi-dimensional, the plot flows well, there is drama and moments of tension when you just can't put the book down. It's an interesting story well told. But there's more. The book is well researched and really takes you into the Tudor days, the way people thought or acted and why, the ideas of honour and loyalty, which are somewhat different from ours nowadays, are shown in a way we (or at least I) can understand and relate to. There are several layers in the story: the historical background of Henry VIII's reign, in particular the implications of his decisions regarding religion in the lives of his subjects; what a young woman (in our eyes, a girl) could expect from life and what was expected from her; the complex social system... It was interesting to see all you normally read in history books from another point of view. I would love to read more about the life and times of these characters! I enjoyed this book very much. It tells the story of Nan, a 15 year old girl living in the turbulent Tudor north at the time of the rebellion against Henry VIII and Thomas Cromwell. Nan has to navigate a precarious path between her faith and temptation, and Katharine skilfully combines a page turning story with fascinating historical detail. Highly recommended for young and not so young adults. This was an exciting read about Tutor England. I liked the main character. It was an exciting read and seemed a bit different to the standard historcal novel. THIS BOOK WAS PROVIDED TO ME BY THE AUTHOR IN EXCHANGE FOR AN HONEST REVIEW. THANKYOU! THIS DOES NOT EFFECT MY OPINION IN ANY WAY. I must admit, it's been quite a long time since I read this book. It's also been quite a long time since I actually wrote a book review too. Basically, this review might be a total mess and it's pretty short. Sorry about that! Five wounds follows the story of Nan and is set during the Tudor times, which is an era I know nothing about. Luckily I didn't find the historical aspects of the novel hard to understand at all and I really enjoyed reading about a time period that I hadn't read about before. I can't say whether the book was historically accurate or not, but I definitely got the impression that Katharine Edgar had done her research and knew how to realistically present the time period. I enjoyed Nan as a character; although she could be frustratingly naive at times I thought she was a strong and compelling protagonist for the story. I appreciated the fact that her actions made sense with the upbringing she had instead of just forgetting that to make the story easier. As for the side characters, they were interesting enough whilst I was reading but I honestly can't remember anything about them now. There were quite a lot of characters and I just felt like they needed a little but more development and individuality in order to stand out from every other fictional character. I found the plot to be interesting for the most part, however it definitely dragged at times and I found myself starting to lose interest. One of the main things that restricted my enjoyment of this book (not that I didn't like it, I really did!) was that I read it during Dewey's 24 hour readathon, so I was pushing myself to read it as fast as possible and not giving myself time to take everything in. I probably would have enjoyed it even more if I had given myself more time and noticed the slow parts of the story less than I did. The plot definitely picked up near the end of the book, and there were some scenes that totally had my heart racing. Also, the name of the town I live in was mentioned at one point during this book and it made me a lot more excited than it probably should have. There are never any books set where I live! Five wounds was an interesting read, totally unlike anything I've read before. I really enjoyed the historical aspects and the story was very intriguing, however it didn't stand out from all the other books I read and I found the story dragged at times. I loved this book. I've struggled to find something engaging to read lately and this is exactly what I needed. Five Wounds is a well-paced novel, set in Tudor times during The Pilgrimage of Grace - an uprising in Yorkshire in protest against Henry VIII & his break with the Catholic Church, the Dissolution of the Monasteries, and Thomas Cromwell. Five Wounds follows feisty & independent 15 year old Nan and her journey th I received a free copy of this e-book in return for an honest review. Five Wounds follows feisty & independent 15 year old Nan and her journey through the rebellion. It tells of her struggles with an unwelcome betrothal, love, friendship, trust & betrayal. The story is filled with rich descriptions and historical detail and the narrative includes facts about key issues and characters during that time- namely The Duke of Norfolk and Robert Aske, as well as King Henry VIII. This book was so engaging. As was its main character Nan. Brave, principled, unconventional and abused. The book really shows how many ways in which women were at the mercy of the men in their lives. It pulls no punches as to the brutality of the times and the violence that men perpetrated on themselves and anyone else in their way. The story built up throughout the book. The descriptions of the scenes were vivid and real. It didn't take too much imagination to understand the fear, excitement an This book was so engaging. As was its main character Nan. Brave, principled, unconventional and abused. The book really shows how many ways in which women were at the mercy of the men in their lives. It pulls no punches as to the brutality of the times and the violence that men perpetrated on themselves and anyone else in their way. The story built up throughout the book. The descriptions of the scenes were vivid and real. It didn't take too much imagination to understand the fear, excitement and passion as it was happening. An interesting and deft story of Nan, a young girl during the reign of Henry VIII; brought up in a nunnery now dissolved by Cromwell's troops she has returned to the family home to be married off to a neighbouring lord. As the tensions rise in England, with the family of Nan's betrothed involved in the Pilgrimage of Grace, Nan is forced to consider he religious principles and the shape of her life changes. I enjoyed the historical fiction, but got lost at times with the adventure. However, I always went back for more and I'm glad I did. Katharine Edgar grew up in Essex. She has worked in museums, universities and in archaeological interpretation. She lives in Yorkshire in an old, cold house full of mysteries. 'Five Wounds' is her first published novel.